Auckland Volcanic Fields is part of the Tentative list of New Zealand in order to qualify for inclusion in the World Heritage List. Most countries seem to try to get some aspect of their Capital onto the WHS list if they possibly can. Auckland’s numerous volcanic remains are geologically significant and many of them also have historic value as the location of Maori settlements (or “Pa”) and continue to have cultural value to Maoris to this day. Anyone visiting Auckland should try to take in at least a few of the locations which NZ might one day propose for inscription. It won’t be difficult as some are virtually in the city centre and provide excellent views across this attractively located city as well as being interesting “outings” in their own right for both natural and cultural reasons. This document provides a comprehensive description of the Volcano Fields nomination as included in the T List (http://www.doc.govt.nz/upload/documents/getting-involved/consultations/consultations-results/our-world-heritage/our-world-heritage-6.pdf ). But it is worth noting perhaps that the site is currently 7th in sequence for nomination amongst the 8 currently on NZ’s T List – behind Kerikeri and Waitangi which we also visited during a short visit to NZ during 2012 (see my reviews) . Whether this is due to concerns about its viability as a nomination or because of the work which still needs to be done isn’t clear. It is noteworthy that NZ hasn’t made a single nomination since it registered its revised T List back in 2007 and, before that, had made no proposals since the successful nomination of its sub-Antarctic Islands as long ago as 1998. This web site - http://www.doc.govt.nz/getting-involved/consultations/results/nz-world-heritage-sites/ states “It is anticipated that site nominations will commence in 2008 and will continue to at least 2015.” Well that target didn’t get hit did it! I find NZ’s inactivity in this respect somewhat surprising! If you read the above pdf download, you will note that it identifies 16 sites of cultural and 12 sites of natural value – though some of the cultural sites also have natural value and vv. We had the advantage of NZ friends who drove us around Auckland both north and south of the harbour. We took in Mt Eden and One Tree Hill together with Otuataua Stonefield south of the harbour and North Head on the northern side. You will also see some of the other cones from Eden and One Tree. NZ, by the way, is undergoing a process of “maorification” of its place names, spellings and pronunciation and it applies to all the locations in this site! We found “One Tree Hill” particularly worthwhile. 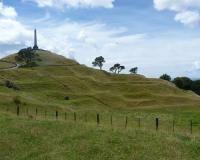 From its 183m summit, a vast area of Maori earthworks can be made out on all sides (photo). It is claimed (with what justification I don’t know) to be the “largest pre-historic earthwork fortification worldwide”. As well as its own “domain” it is flanked by 2 other parks and provides a fine geen area in this sprawling city. Mt Eden is slightly taller at 196m. It too has terraced earthworks but is generally a more compact cone and is more hemmed in by the city. It does however have much closer views of the city centre and right into Eden Park stadium! A Maori ranger was there during our visit and we had an interesting conversation as he explained the Maori significance both of this location and others in view –e.g the canoe portage between the east and west coasts at Te Tō Waka, a 200m isthmus now totally built up. We made the long trip out to Otuataua Stonefield near the airport but this site yielded little of value to the uninformed visitor. It is said by the site brochure to be “an internationally significant heritage landscape and an important natural, archaeological and historic area.” It contains the remains of where Maoris lived, fished and farmed for over 800 years and may indeed be archaeologically significant. The area looks as if it is to be developed in future years – a car park has been built and a visitor centre is planned (perhaps as part of its “fattening up” for WHS status?) but there was little on site information and one of the few signs was to ask us not to walk on the summit of the volcanic cone. Its Web information states “The reserve is waahi tapu (a sacred place) to descendants of Te Wai O Hua and Waikato Iwi of the Tainui waka (canoe). Please be respectful while visiting. Tangata whenua have especially requested that food is not consumed on the reserve (water bottles are welcome) and that visitors refrain from walking on the top of Puketaapapa volcano, a site of particular traditional significance (follow the walk marker posts around the northern side)." Our visit to North head had nothing to do with its T List status, which I wasn’t aware of at the time anyway, but as a pleasant place to spend time with our friends near their home, to take in the fine view across the harbour to downtown Auckland and to visit the gentrified period suburb of Devenport. The location has long been connected to the Navy and the volcanic rocks are riddled with defensive and storage tunnels. Signs explain the geological processes which created it and, on reflection, that was an aspect of the entire site which perhaps we didn’t adequately cover but which is a significant part of its potential OUV. As we sailed out of Auckland Harbour that evening we passed the island of Rangitoto. This volcanic island, now run as a nature reserve with a still ongoing process of removing all non native flora and fauna, was created as recently as 550 to 600 years ago and is part of the T List site (the documentation describes it as “the geological jewel in the crown”). The Auckland Volcano field consists of “Monogenetic” volcanoes, which means that there is only one eruptive event at each but that these events are scattered across the entire field – so, one day perhaps a new volcano will appear under down-town Auckland! Indeed since 2002 there has been a “Contingency Plan” for just such an event! In conclusion, if you are in Auckland you will almost certainly by default visit at least some part of this site, but it is perhaps worth seeing it as a whole in both its natural and cultural aspects rather than as just a few “hills” from which to see the city! The site’s potential for inscription relies heavily on these 2 aspects - “It is this integrated combination of pre-European Maori occupation relying on the natural resources of a young and still active volcanic field that is outstanding on the world stage”. Whether NZ can adequately cover the management and integrity issues after the years of quarrying and construction etc remains to be seen but the site would seem to have a good chance.